Momma Melly: Happy First Of December! Yesterday we went and visited Santa Clause. We typically visit Santa in town, but we decided to travel a little. The area we live in doesn't have a large selection of stores, so we went to the city for shopping. While in the city, we stopped and seen Santa. My little guy was a little upset afterwards. He told me that Santa didn't even ask him what he wanted for Christmas! He just sat him on his knee, took a picture with him and gave Tyson a couple candy canes. 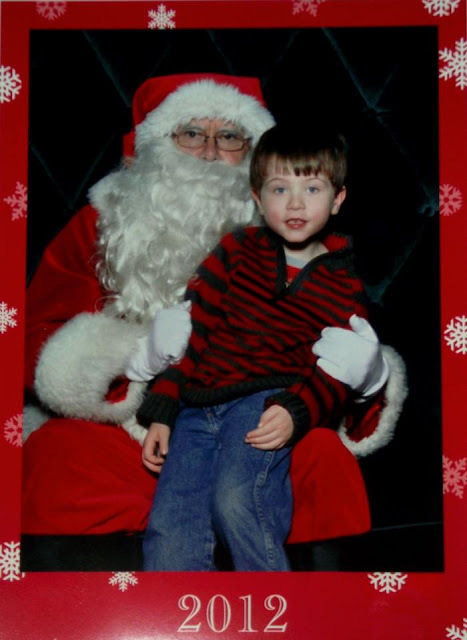 So, doing what any 5 year old would do, he screamed out his wish list to him as we were leaving. (He makes me laugh!) He's hoping that Santa heard him! But, just to be on the safe side, we will go visit Santa in our local area soon.